Please note that this tutorial does not suit for Entity Framework Core. ADO.NET Entity Framework is an object-relational mapping (ORM) framework for the .NET Framework. It is designed to enable developers to create data access applications by programming against a conceptual application model instead of programming directly against a relational storage schema. The goal is to decrease the amount of code and maintenance required for data-oriented applications. In order to connect to a PostgreSQL server you need dotConnect for PostgreSQL installed and IDE running. ADO.NET Entity Framework requires .NET Framework 3.5 Service Pack 1 or higher, Visual Studio 2008 Service Pack 1 or higher, and PostgreSQL server 8.0 or higher. Note that Entity Framework support is not available in the Standard Edition of dotConnect for PostgreSQL. For Entity Framework v6, you will also need a NuGet Visual Studio extension installed since it is used for adding EntityFramework NuGet package. Alternatively you may create model for Entity Framework v1 or v4, which don't require NuGet, in this tutorial. Note: replace 7.1.26.0 with the actual assembly version. In the Solution Explorer right-click the the project and select Add | New Item. 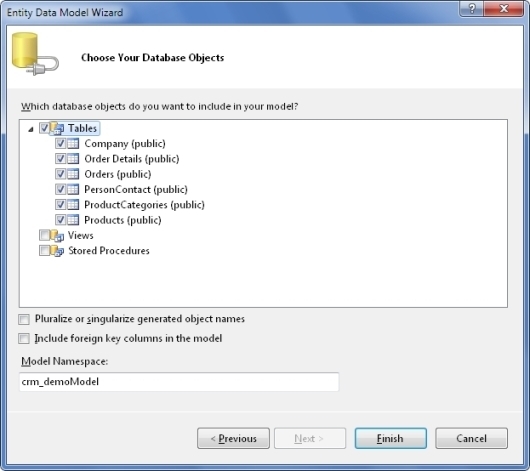 In the dialog box select ADO.NET Entity Data Model, click Add. 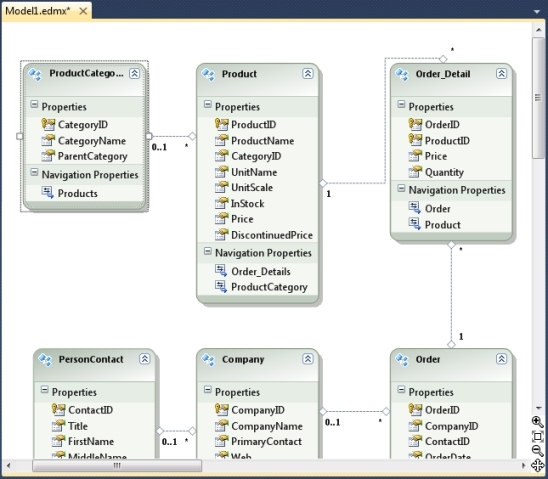 This launches Entity Data Model Wizard. 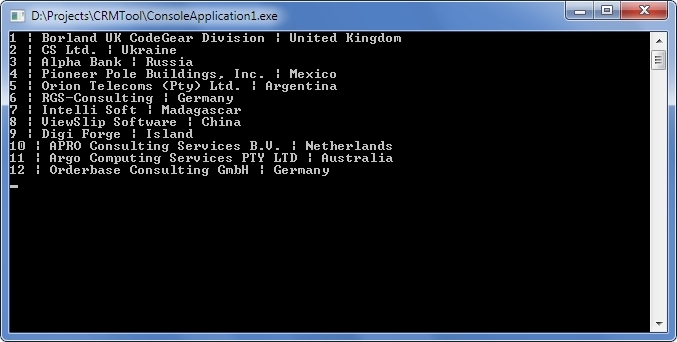 In the wizard select Generate from database, click Next. Pick an existing dotConnect for PostgreSQL connection string or create a new one. When creating a new connection select PostgreSQL Database in the Data Source list, then dotConnect for PostgreSQL in the Data provider list. See the screenshot below. In the field Save entity connection settings... type CrmDemoEntities. This will be the name of the main data access class. Click Next. The wizard creates classes for all selected tables that represent entities. It also creates a descendant of System.Data.Objects.ObjectContext class, which controls the connection to the database, and the whole data flow. This class includes properties and methods named after your database objects. You will use these members to retrieve and modify data in the context. The code is contained in an autogenerated file Model1.Designer.cs (Model1.Designer.vb). Note that if you have an association between two properties of non-coinciding numeric types, you can manually change both conceptual and storage types to the type that will be wide enough to include data for each property. To extract an instance from a context use the DeleteObject method of the context. The object is removed from the collection of its type, but not destroyed. To delete the object's data from the database invoke the SaveChanges() method. We recommend you to use Entity Developer (Devart Entity Model, *.edml) instead of EDM Designer (ADO.NET Entity Data Model, *.edmx) because it is adjusted for working with PostgreSQL and has an advanced functionality. Additionally, Entity Developer adds registration of EF6 provider in app.config automatically and offers designer (Database First / Model First) for EF Core. For hands-on experience, download the separate Entity Framework Query Samples package or use samples shipped with dotConnect for PostgreSQL. These samples are described in the Entity Framework Query Samples article. You also can access the samples from the Start menu.